Although I haven’t had time to make any new pieces for my label for ages, I’ve been thinking a lot about kimono lately – mainly because I’m in the process of translating a book about kimono for a Japanese publishing company. Today, in between checking out completely unrelated blogs (dammit all you stylish ladies who like to sew! you’re so distracting! you know who you are!) 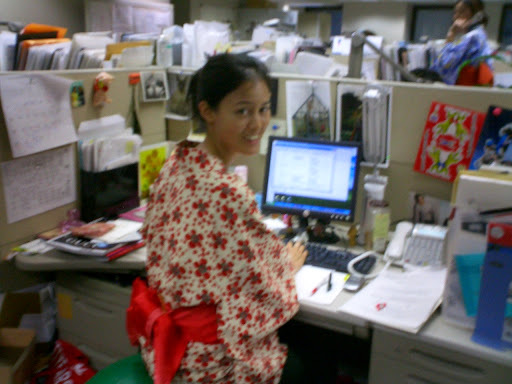 I managed to translate EIGHT WHOLE PAGES (*thunderous applause*) about yukata, or summer kimono. Despite living in Tokyo for nine years, I only ever wore a kimono once for a photo and nearly died as they are so restrictive – the Japanese version of an extremely tight corset, basically. I wore a yukata maybe twice in all that time – and once was only for a ridiculous party we had at work… every year the editor in chief’s birthday was an excuse to dress up to a theme which was always ever so slightly tipped in a fetish direction (well, a Japanese fetish anyway as I doubt many western guys fantasise about women in yukata). Air hostesses, nurses, schoolgirls, and yukata were just some of the themes that I remember. Anyway, in celebration of my effort today, here are some very bad pictures from that party several years ago! I turned the obi that I was wearing into this skirt, which was too small to fit on my mannequin, hence the horrible picture and the fact that it remains unsold in my linen cupboard! You might be able to tell that cherries are woven into the material, which is a deep pinky orange colour… so beautiful. I did also manage to wear it in a picture for a local newspaper, along with a top I made even longer ago, but it’s not easy to see in that shot either, especially at such low res! I've never been to Japan and imagine a trip would result in a huge and costly shipment of fabrics back to my little wilderness! Kimonos look so graceful, I had no idea they were restrictive. 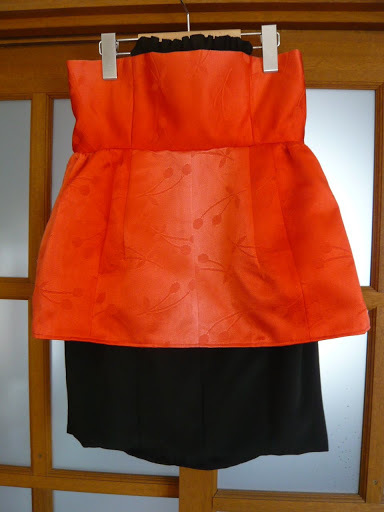 Gorgeous top and obi skirt – you have to get sewing again so I can drool over your creations! Your boss's fetishes seem to involve a theme of female servitude. Nice! Even though I use kimono and obi all the time in my dresses, I don't really know that much about them… but since starting to translate this book I've learnt a lot more… one of the chapters is about women who have just started wearing them and one practised in a really hard-core way, and finally was able to get dressed really quickly – in TWENTY MINUTES. Apparently that's considered quick. Another tale – in the great earthquake of 1923, the reason so many women died is because they don't wear underwear with kimono so were embarrassed to jump out of buildings to be caught by firemen!! Really not the most practical of garments, although they are stunningly beautiful.